It’s Friday. People in Denver race off to their favorite spots for happy hour . . . some times sneaking away from work a bit early to catch the warm 4 o’clock rays on a restaurant patio. The Mile High city has a reputation for great early evening deals. People love this time of day. And though we often partake in the end-of-work-week ritual, the sun is shining and the mountains beckon. Today, we drive to a different beat than the normal happy hour crowd, but that’s part of running a brewery blog . . . poor us, to be motivated to venture outside of Denver for the next happy craft. We load-up our camping gear, pack some happy hour food and beer rations of our own, and head for the hills. 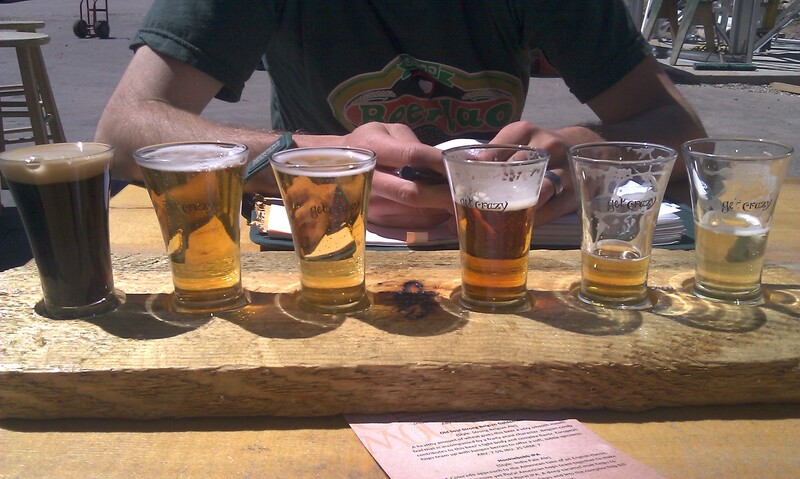 In less than two hours we’re sipping on a tasting tray at Crazy Mountain Brewery in Vail. As far as mountain breweries go, this one is on top of the taps, pouring delicious beers like their Wail Pale Ale, their Old Soul Strong Belgian Golden Ale, their Cara de Luna and their Horseshoes and Hand Grenades ESB. We enjoy these beers alongside our home-packed happy hour picnic, and then head for the next brewery bar, Bonfire, of Eagle. We’re greeted with a warm smile and a welcoming explanation about what’s on-tap and the best way to go about sampling their beer. Lindsay had a similar welcome when she visited Bonfire six weeks ago. We certainly appreciate the hospitality, and though we’ve come to expect this at Colorado Breweries, some places forget the greeting. So we engage with the bartender and some local customers who are also enjoying the beer at this mountain-style happy hour. 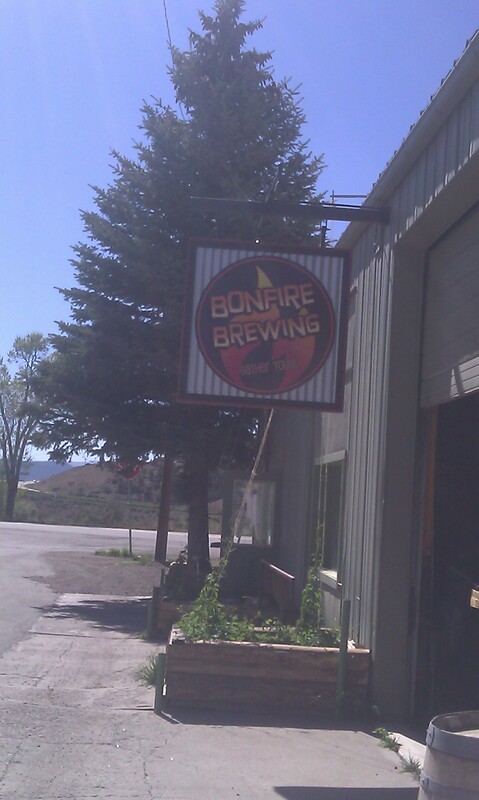 Not only has Bonfire created a lovely community gathering place, they’re also creating some superb beers. We tried several of their beers: the Second Street Yeti Stout, the Firestarter IPA, the Awry Rye Pale, the Demshitz Brown, and the Dumpin’ Dunkel. While all their beers were absolutely delicious, the Demshitz Brown offered a new insight into Brown Ales. The Demshitz boasted lots of complex flavors, with smooth, smokey notes that made the sometimes unpleasant and excessive chewiness I usually find in this style, vanish. 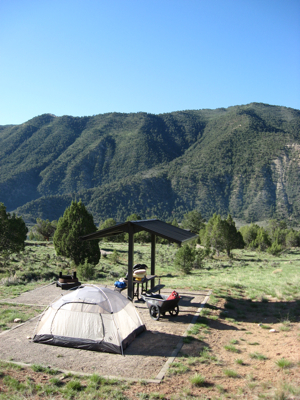 After a sip or two more, we head farther west on the main line, arriving in Rifle with enough time to set-up camp in the dusky light at Rifle Gap State Park, have another snack, and then wander our way into Rifle Brewing at Sammy’s. We nestle Lindsay’s little Subaru in between two large trucks, one Ford, one Chevy, (a well-balanced town), and head inside. Our Friday happy hour has turned into a six hour tour, filled with tasty beer, delightful conversation, and the ever-present Colorado scenery. So Rifle Brewing offers a perfect finale with their six beer tasting tray of diverse styles (though we think the bartender would prefer if you ordered a pint . 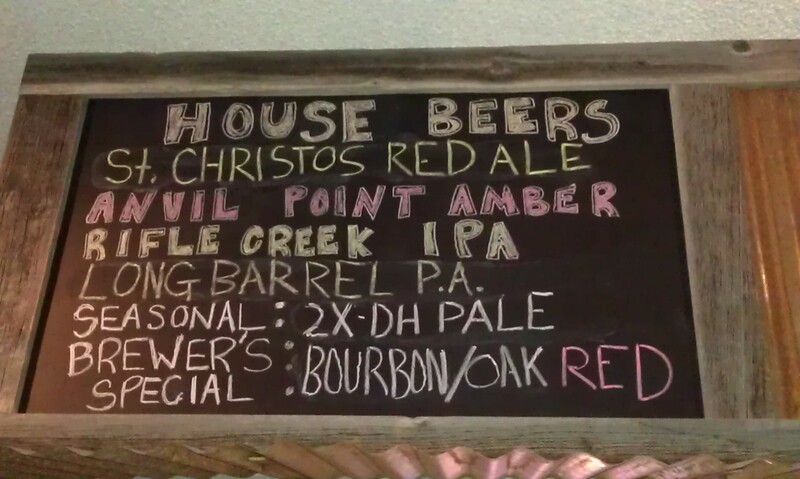 . . if so, and you’re not driving, we’d recommend the Brewer’s Special, the Seasonal, or their Pale Ale). And the owner, Shaun Brainard, treated us to a special tour of their brewing room, which is a beautiful little space that cranks out a lot of beer. When we arrive back at camp, the almost full-, almost super-moon, lights up the entire Gap. Ghostly mountain ridges appear all around us, and the ripples on the lake down below reflect the moon’s white light. This is not an epiphany, just a simple reminder that Colorado is filled with stunning scenic expanses and endless hours classified as happy. 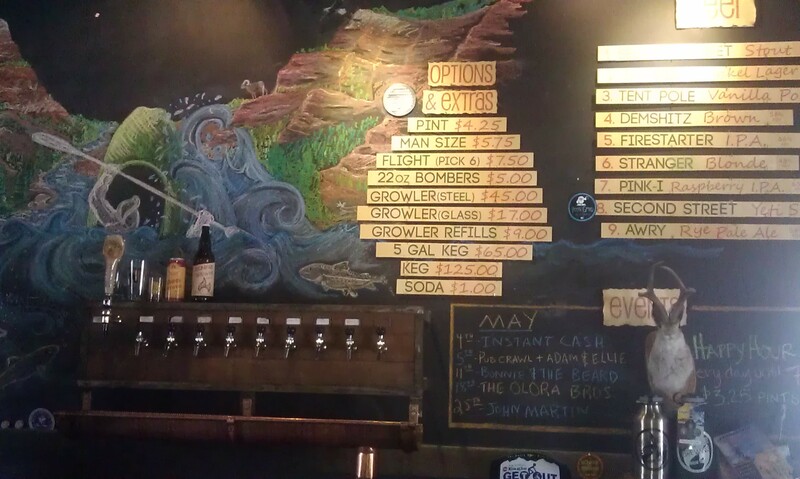 This entry was posted in Craft Beer Adventures, Tasting Highlights: Breweries and tagged Bonfire Brewing, Crazy Mountain Brewing, Denver Happy Hour, I-70, Rifle Brewing, Rifle Gap State Park, Super Moon, Vail Valley.